Give that special dog lover in your life something unique, memorable and deeply meaningful. 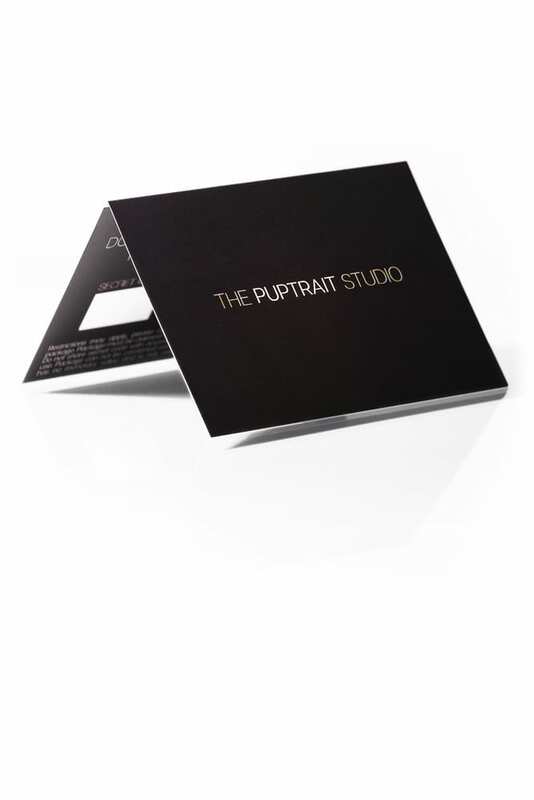 Unlike traditional gift certificates or gift cards you may find from your typical retailer, at the Puptrait Studio we don't sell cheap looking plastic gift cards. Instead, our version of a gift certificate comes in the form of a luxurious and high quality paper invitation. Printed on extra-thick (32 point) Mohawk Superfine® naturally textured paper, your gift recipient will know that they are holding something special before they even have a chance to open the envelope. Puptrait gift packages are entirely customizable. Choose the value you would like to include on the card, or if you would prefer to be more hands on, instead select a collection of prints in the perfect sizes and ready to hang mounting options. Receive the card to gift it yourself or choose to have us send the gift package directly to the end recipient - allowing for a truly custom gift experience. Custom tailored gift packages are valid for up to 5 years and are available to purchase from our online store in denominations ranging from $100 - $5,000. Other values can be purchased by calling the studio (443.604.0711) during normal business hours. Do you regularly watch or walk the gift recipient's dogs? Bring their pups in for a studio session and surprise the owner with custom prints. This is a great option for spouses, adult children, close friends and anyone else trusted with regularly watching a dog that wants to give something that's a bit more meaningful and creative. As any dog lover will agree, watching and caring for a pet when the owner is out of town or in a scheduling pinch is a blessing in itself. Which is what makes these surprise sessions such a treat. Not only will the recipient love the prints you give them, they'll never see the gift coming - allowing for a truly memorable surprise and a gift experience like no other! View available dates and schedule your session using the digital calendar located below. Not sure exactly when you'll be watching the dogs? No problem! There are zero fees or penalties to reschedule with 48 hours notice.